In my previous post I wrote how I had had a bit of a rough hospital admission and ended up in intensive care, which is not new. I have been before several times and this time in all honestly was not the worst I have been. I wonder if that is why I am having so much difficulty coming to terms with what happened and why I am getting so many memories about previous bad asthma attacks which ended up in critical care. The first time I ever ended up in intensive care was by far the worst experience of my life but because I was away from home and in a private health care system in Canada I got excellent post ITU care with support to deal with the after effects. In comparison this last admission was a walk in the park compared to the first which I remember like it was yesterday. 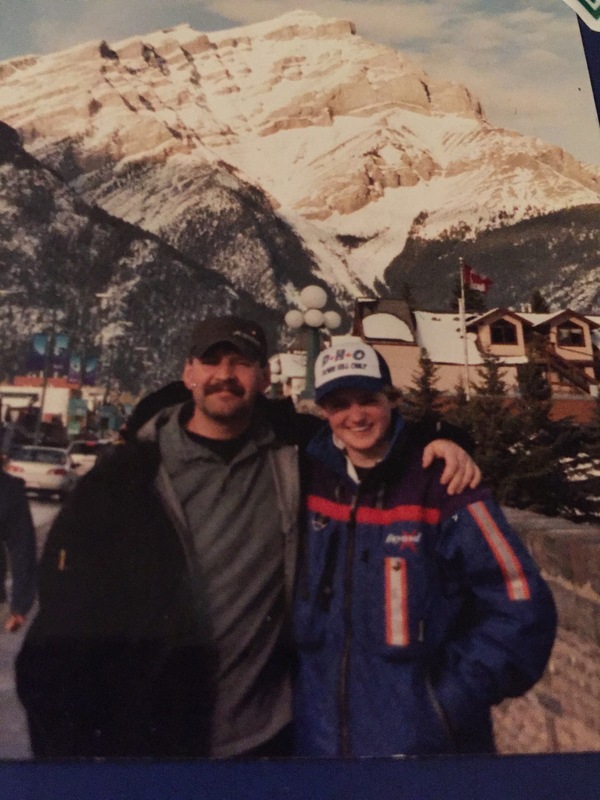 I was doing my course to become a ski instructor in Fernie Canada and having a great time that was until I got pneumonia in both lungs. This photo was taken about 4 hours before I was taken into hospital! I was admitted to hospital one night with a bad asthma attack as a result of the pneumonia. It took ages for them to get me stabilised and moved from the ED to the ITU but they quickly found because of my slightly tricky asthma they were out their depth and I had to get an air ambulance from the local hospital in Fernie to Calgary about a 4 hour drive or just over an hour by helicopter. I was wrapped in this weird heated sleeping bag thing and had massive head phones on. I remember thinking that this would be a trip of a lifetime if only it was not under such circumstances. The views must have been spectacular as we flew across the rockies but I have no idea. I was fighting so hard with my breathing that I really didnt take in where I was or what I was doing. The one thing I do remember though is that the helipad was on the roof. I had a flashback of this when I was watching a episode of Grey’s Anatomy when a helicopter landed on the roof of their hospital. I remembered it so clearly it was strange. It was the Peter Lougheed Hospital and I can picture it all like I was there yesterday. When I had that moment of deja vu when watching TV I had to google the hospital to check if I was imagining something or it was real. It was real! Anyway I am digressing. Once landed and taken down to the ED they called my dad and the room I was in had him on speaker phone so it was surround sound. It was really odd it was like he was in the room with me rather than across the other side of the world in the UK. He flew out to me though because I was quite unwell. He looked after me really well and still does. What I am trying to fathom is that the experience above is far worse than what happened recently, I was in another country and really very ill and only 18. Back then I was much more live by the seat of my pants and didnt really think to much about things whereas now I have to take responsibility for what I do and what I put my body through so can’t take the risks I used to without serious consequences. In times gone by I have not given much care and lived my life but now I find it hard that I am doing all I can to keep myself well and keep my asthma under control yet it is still constantly there never giving me peace. I try to use it to the positive with AUKCAR etc but it would be nice to to have its physical presence there so much. When I am drifting off to sleep just now or dosing on the sofa I keep waking with a start and gasping for breath. I was doing this when I was in ITU. When I fell asleep or dozed off my sats would drop and either I would wake myself up not able to breathe or the nurse would wake me up. Part of me as well keeps seeing myself visiting myself in ITU which is a really strange concept but I keep seeing myself standing at the end of the bed telling myself to try harder and put more energy into breathing. I felt like I was breathing so hard and it was so much work that I just wanted to give up and sleep. It was also all the attempts to get blood gases and lines in which they eventually decided not to because it was so tricky but it was so harrowing with blood everywhere. Its nothing new for there to be a lot of blood getting lines in so I don’t know why I am finding it hard to grasp but I wonder if because my oxygen level was so low and my lactate so high and all my other electrolytes were a bit messed up that it distorted my thinking and understanding more than normal. My potassium and phosphate were virtually unreadable so I had to have potassium infusions, polyfusers and other bits and pieces to correct everything. I had hoped that by writing everything down I might be able to make sense of what happened but it still bothers me. There is still a lot to write about but I find I am jumping from one thought to another now rather than logically going though events as they happened and then putting them to bed. I still have to deal with the fact I am not allowed to go skiing because of all this. I have tried to look after myself so well and my best efforts are still not good enough. Right now it really does just make me feel a bit rubbish. I know I should be grateful I am still here and alive which I am grateful for but I am finding there are only so many times I can be knocked down by it before giving up trying to do what I want to do, keep my job and enjoy life. On that nice positive (read negative) note I will go before I go into even more self pity.